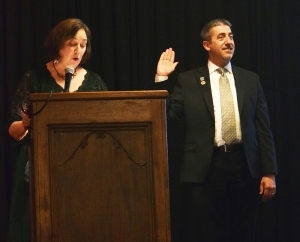 The Santa Clara County Association of REALTORS® (SCCAOR) installed Gustavo Gonzalez as its President during an evening ceremony at Villa Ragusa in Campbell on January 24. He will serve as the 2019 President of SCCAOR, a real estate trade organization that represents over 6,400 REALTOR® and Affiliate members in Santa Clara County. Gonzalez is the Broker/Owner of Valley View Properties based in San Jose. He served on the SCCAOR Board of Directors from 2007 to 2009 and was Vice President in 2014 and President-Elect in 2018. He has also been a member of the SCCAOR Professional Standards Committee since 2008. Other SCCAOR Officers that were installed include Sandy Jamison (President-Elect), William Chea (Vice President), and Stephen Theard (Treasurer/Secretary). They will be joined by SCCAOR Board of Directors, which includes: Kip Barnard, Frank Cancilla, Helen Chong, Kevin Cole, Teressa Francis, Doug Goss, Gene Hunt, Don Jessup, Trisha Motter, Gabrielle Perez, Tam Quach, William Rehbock, Rick Smith, and Mark Von Kaenel.